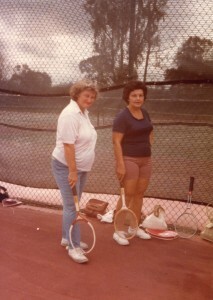 Eleanor Owens with student in the early days of the Highland Park Tennis Association. 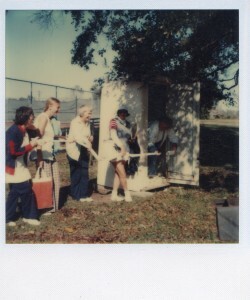 For 39 years, the Highland Park Tennis Association has hosted a doubles round robin at Highland Road Park in Baton Rouge, La. The round robin, started by Eleanor Owens, is one of America’s greatest, grassroots-tennis success stories. 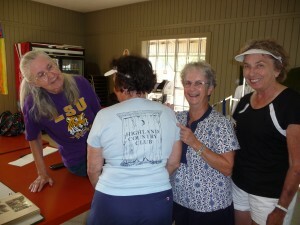 Owens, a long-time tennis instructor in Baton Rouge, started the round robin in 1976 for her ladies’ class as a way for her novice students to practice under competitive conditions, but without the high pressures of league play. Charter member Alice Robertson remembers that the ladies were eager to play on Highland’s new courts, but the concrete was barely dry, and all that stood were the net posts. “In those days, there were only six courts at Highland Park, no lights, no park attendant, the ‘clubhouse’ was a shack with a telephone, and the restroom was ‘portable,'” Robertson added. Owens held the first round robins at Highland Park during the week and during the day because Highland didn’t have lights. An evening round robin was added at Independence Park, but was moved to Highland as soon as that park got lights. Eventually, a Saturday round robin was added to accommodate people who worked during the week and to avoid scheduling conflicts with leagues. By October 1977, the organizers of the round robins formed the Highland Park Tennis Association, and Jo LeBlanc published the associations first newsletters. 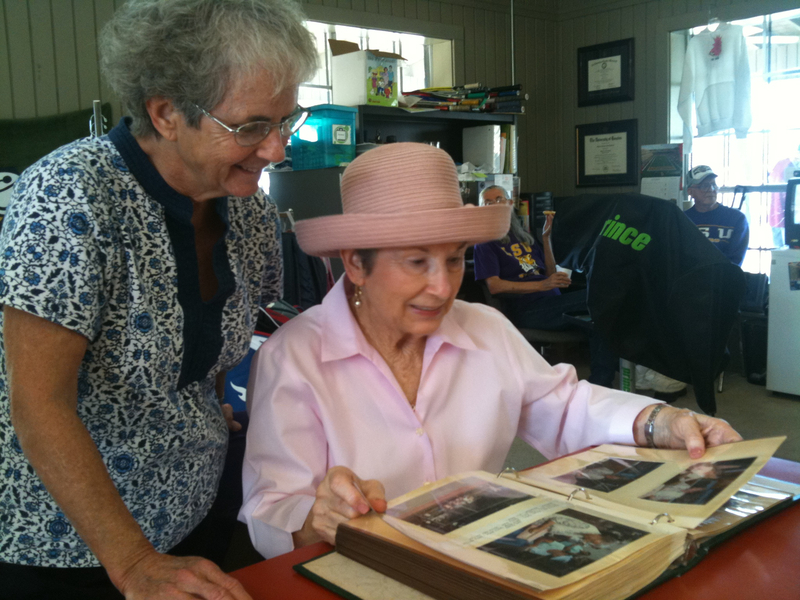 According to early HPTA records and LeBlanc’s newsletters, HPTA membership grew quickly. In 1977, the Bettye Burford was elected HPTA’s first president (see list of presidents here), and the membership totaled about 75. One year later, almost 100 players called HPTA home. The tournament was popular, particularly among Eleanor’s students and their friends, but HPTA member John Delaney was concerned that a woman’s name in the title (even Eleanor’s respected name) was giving men the impression that it was a tournament for women only. So, the HPTA renamed the tournament “The Highland Open,” and it began to “take off,” recalls Mary Lynn Segalla. In due time, HPTA became a bustling tennis community, complete with inter-club competitions in Baton Rouge and many points south, including Thibodaux, White Castle, Plaquemine and Donaldsonville. “Those inter-club travels were funny. Everywhere we went, other players would ask ‘What club are you from?’ Later, they would just laugh and say, ‘Here come the park people,'” Segalla remembered. Alice Robertson still has her original “Highland Country Club” shirt, complete with the outhouse graphics. “Finally, we decided to make a joke of it, so we wore matching t-shirts that had ‘Highland Country Club’ printed across an outhouse. We were a big hit everywhere,” Segalla said. One favorite destination for the “Highland Country Club” was the annual Grand Isle Tournament, or G.I.T., as it was called. “We’d pile in the cars and drive down there for the weekend, play tennis, play some cards, and have a great time. 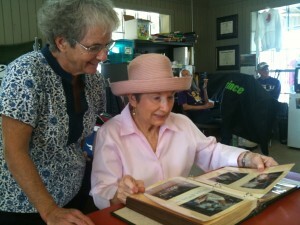 Those were some of our best times and memories,” said Lucille Hicks Doane. Today, Robertson, LeBlanc, Segalla, Doane and other charter members are amazed at what HPTA has become — or that it even lasted very long. Bettye Burford, HPTA’s first president in 1977, says it’s hard to believe that HPTA continues more than 30 years later. “We had no idea what we were starting then. We surely didn’t imagine it would exceed 240 members like it does today and realize more than 75 players every Saturday at the round robin. It is so gratifying to see how successful it has become,” said Burford.